HARMAN’s Soundcraft and Studer’s Italian distributor, Leading Technologies Srl, along with sister company Sound Light & Technologies (SL&T) recently participated in a recording project with RAI Radio, using a combination of Soundcraft and Studer digital mixing platforms to optimize the sound. 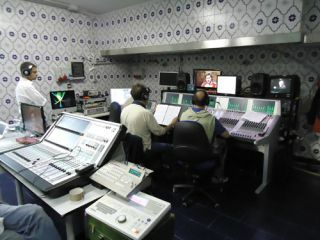 The production of Rossini’s La Cenerentola (Cinderella), which involved around 250 members of cast and technical crew, was mixed on a combination of three Studer Vista 9 and Vista 5 consoles, with three further Soundcraft V1 desks providing backup. These were used in four different scene locations; while the actors, singers and choir were variously located in Parco della Mandria in Venaria, Palazzina di Caccia and Palazzo Reale in Torino, the orchestra was recorded remotely at the Auditorium RAI in Torino. A multitrack recorder received the audio via a MADI port on the Vista 9. The orchestra required 68 microphone channels on the desks with a further 12 channels for the choir. The event was transmitted live around the world over a 2-day period in early June, and the DVD, produced by Rada Film, will be available soon. Rada Film has the production rights for Cinderella under the authorization of Andrea Andermann with the direction of Carlo Verdone. Providing the technical interface between Rada Film and RAI was Alessandro Bernardi.